(AFP) - More than 120 people have died and many more are missing in Mozambique and neighbouring Zimbabwe on Sunday after tropical cyclone Idai barrelled across the southern African nations with flash floods and ferocious winds. Authorities in Mozambique said the toll there had risen to 62 in the centre of the country, while Zimbabwe said 65 people were killed in affected eastern areas, after the cyclone tore across the region on Friday and Saturday. Mozambique's environment Minister Celso Correia gave AFP the country's updated number of deaths in Beira and Dondo districts, but warned: "We will certainly end with a higher toll." "I think this is the biggest natural disaster Mozambique has ever faced. Everything is destroyed. Our priority now is to save human lives," he said at Beira international airport, which re-opened Sunday after being temporarily closed because of cyclone damage. Idai hit Mozambique first on Thursday night before moving to Zimbabwe. In Zimbabwe, eastern Chimanimani district was the worst hit part of the country, where houses and bridges were washed away by flash floods when the storm slammed the area. "So far we looking at 65 people that have lost their lives," Joshua Sacco, lawmaker for Chimanimani, told AFP by phone, adding that between "150 to 200 people" are missing. The majority of those unaccounted for are thought to be government workers, whose housing complex was completely engulfed by raging waters. Their fate is currently unknown because the area is still unreachable. "We are very worried because all these houses were just suddenly submerged under water and literally washed away and that is where we have about 147 missing," he said. "It's very sad and the situation is dire." Two pupils at a secondary school in the area were among those killed, after a landslide sent a boulder crashing into their dormitory, the country's civil protection agency said. Soldiers on Sunday helped rescue nearly 200 pupils, teachers and staff who had been trapped at the school in Chimanimani. The group had to wade through waterlogged and mud-churned roads for some 4 kilometres (2.5 miles) to reach a relief area, where they were given food and checked by medics, according to an AFP photographer. Tents have been set up to provide shelter for those affected by the cyclone and scores of villagers have made their way to the relief area, some having trekked for up to 20 kilometres to reach safety. Roads have been swallowed by massive sinkholes, while bridges were ripped to pieces by the flash floods, according to the AFP photographer. The United Nations in Zimbabwe said that nearly 10,000 were affected by the cyclone. Zimbabwe's President Emmerson Mnangagwa, who cut short a visit to Abu Dhabi over the cyclone, has declared a state of disaster in the affected areas. 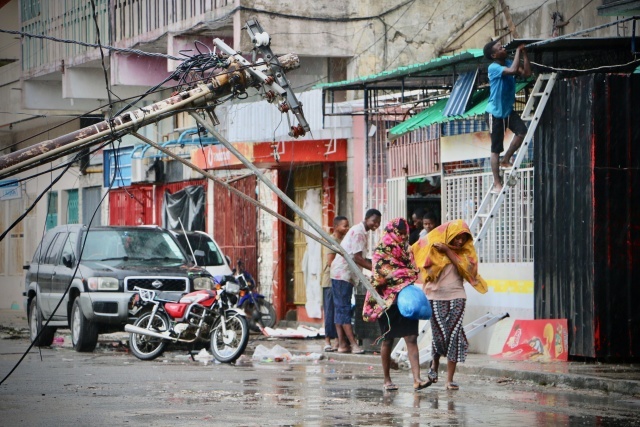 Idai battered central Mozambique on Friday, cutting off more than half a million residents of the port city Beira where the environment minister said 80 percent of the electricity network was destroyed. "All roads are cut, the infrastructure is destroyed, practically everything is destroyed," said Correia. Beira international airport was briefly shut after the air traffic control tower and navigation equipment were partially destroyed by the cyclone. Flights began flying in on Sunday. A significant part of the central region was "absolutely decimated by this cyclone, even larger than anticipated," said Jamie LeSueur, the International Federation of Red Cross's roving emergency operations manager for Africa after an aerial survey of the affected areas in Mozambique. "It's bad and there's potential for it to get even worse," he said as rain continued in Zimbabwe, "which could potentially lead to another flood," said in Beira. The World Food Programme (WFP) said its "projections indicate at-least 1.7 million people were in the direct path of the cyclone in Mozambique, and 920,000 people were affected in Malawi. Thousands more are potentially impacted by events in Zimbabwe where assessments are ongoing". Despite having part of its roof torn off, Beira airport was busy handling flights and relief agencies have are setting up operation hubs there. One Portuguese software business company owner Luis Leonor, 49, flew in from Maputo after having contacted with his wife via satellite phone on Saturday. "She is fine. My house is fine but there's no more running water. I don't know what I will find there," he said. "My five employees lost their houses, they are staying at our offices." Even before the cyclone made landfall on Friday, heavy rains earlier this month had already claimed 66 lives in Mozambique and 56 in Malawi.